Posted: March 7, 2013 | Author: thelondoncolumn | Filed under: Artistic London, Graffiti, Public Art | Tags: Haggerston, London graffiti, London street art, Regent's Canal, sweet toof | Comments Off on Sweet Toof. 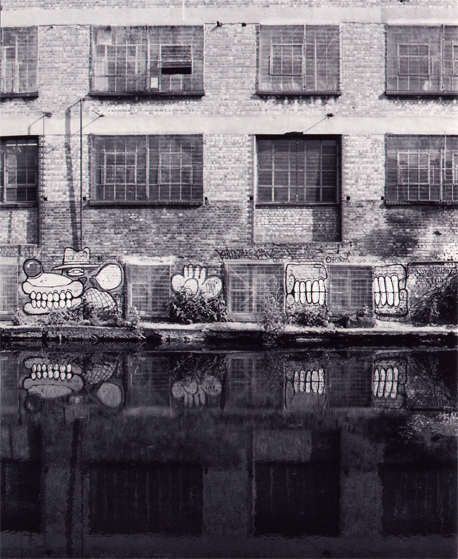 Sweet Toof artwork, Regents Canal, Haggerston. © David Secombe 2010. Sweet Toof is the pseudonymous name of well-known United Kingdom graffiti and street artist. According to an account by Olly Beck, Sweet Toof looked at himself in a looking glass “in crisis after a messy break-up”, with the enlarged and distorted imagery of the “crescents of teeth”, the “visible part of our skeletal frame” as a reminder of mortality. Beck relates Sweet Toof’s concerns and imagery with the 16th Century Northern European “Vanitas” tradition of reminding of the transience and vanity of life, and to the Mexican celebration of skull imagery to accepting, honouring and celebrating death as part of the life trip.